The Short Version: In the modern dating world — where courtship takes place screen-to-screen as much as face-to-face — people all around the world have turned to the emoji to add dimension to their conversations. However, with over 1,300 emojis from which to choose, it can be hard to know when to use what, and how. That’s where Emojipedia saves the day. The preeminent database of all things emoji, Emojipedia has every emoji — and everything you could possibly want to know about each one. While pictographs are often associated with ancient cultures — the hieroglyphs of Egypt often come to mind — they have never truly fallen out of use. Pictographs pervade our everyday culture, showing up on menus and traffic signs, bathroom plaques and computer screens. In a world containing more than 7,000 different languages, pictographs can be a nearly universal form of communication. A modern hieroglyph, the emoji has become an important part of digital communication. The latest in the line of graphical languages is the digital emoji — a library of characters designed to integrate into text, augmenting every typed language with a universal set of pictographs. In an era where most communication has been relegated to text messages and emails, the ability to apply an extra layer of tone or meaning can be extremely helpful — especially in the online dating world, where so much of the courtship can take place on a screen. With people all over the world using emojis to add clarity — or just personality — to their text-based discussions, there’s no doubt that emojis are becoming a real part of the conversation — ? — when it comes to digital communication. The official Unicode emoji library contains over 1,300 unique characters, and while a great many of the characters are simple illustrations of nouns — car, mountain, candle — there is more to each emoji than meets the screen. 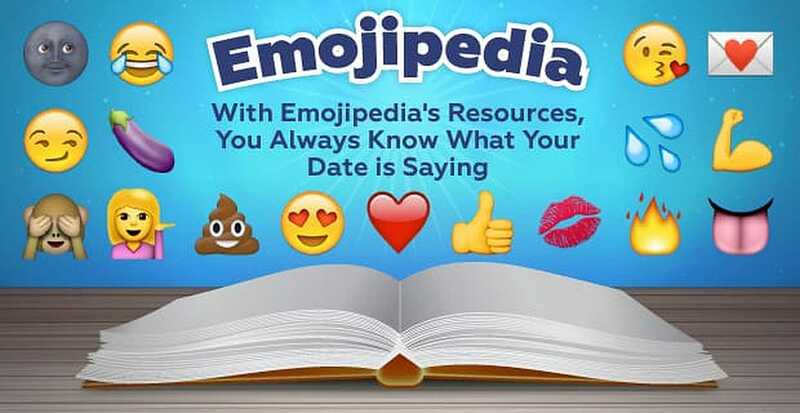 Emojipedia provides not just the name of an emoji, but the evolving cultural meaning as well. With so many characters and so many different ways to interpret them, it can be easy to make an emoji misstep. You may just be inviting your beau to the farmer’s market, but the “aubergine” (eggplant) emoji has taken on a very different social meaning. The easiest way to prevent anything from being lost — or added — in translation is simply to check Emojipedia before you send. 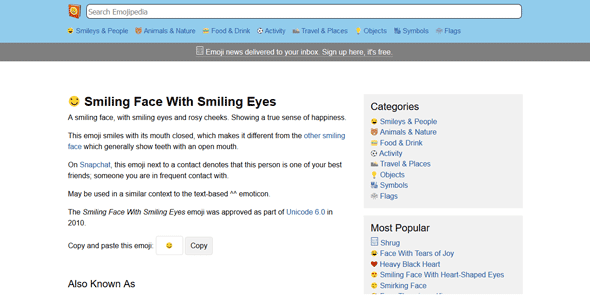 More than just definitions, Emojipedia gives you popular culture uses, as well. “It’s this ridiculously in-depth view of every emoji, and everything that could be useful to know about it,” described Jeremy. While you should always make sure you know what you — and your emojis — are saying, you don’t need to assume that every icon is a potential hazard. Here are a few emojis you can use to spice up the emails and texts in your dating life, risk-free. Its indecipherable Mona-Lisa smile takes on a touch of whimsy when inverted, the combination giving this emoji great versatility. The wink had been around the digital world for years as an emoticon before becoming an official emoji in 2010. The wink emoji can be a fun, flirty way to show your comment was intended to be a joke (you don’t actually want pizza for every meal). It’s also the perfect response to indicate that you understood their double entendre — and approved. While its official name is “face throwing a kiss,” this emoji is often colloquially referenced as blowing a kiss. Another classic, the kissing face is great for more established couples. It’s a romantic way to tell your partner that he or she is on your mind, without making them feel obligated to immediately respond. “I use that one non-stop with my fiancé,” admitted Jeremy. Present on every phone and computer we encounter, emojis have become ingrained in the daily lives of most people using digital communication. Going far beyond simple ornamentation, the emoji is definitely a true phenomenon. Showing the signs of burgeoning into a language all its own, the emoji truly demonstrates the continuing power of the pictograph on the human experience. 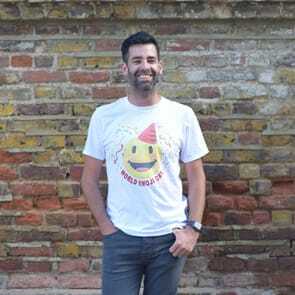 Smiling as large as his emoji, Jeremy Burge, Creator of Emojipedia, celebrates World Emoji Day. The emoji even has its own day: July 17, World Emoji Day. Much like Emojipedia itself, the holiday was started by Jeremy because he simply felt it needed to exist. 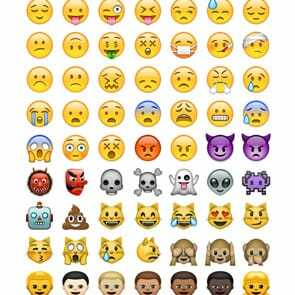 “The emoji has become such a big part of what everyone does. Why shouldn’t it have a day?” Jeremy chose the date based on Apple’s version of the “calendar” emoji, and emoji fanatics everywhere celebrated the first World Emoji Day in 2014. Like the emoji it celebrates, the holiday has quickly become a world-wide event. This year’s World Emoji Day included everything from special product launches — Emoji Pepsi anyone? — to special emoji exhibits, and, of course, tons of parties. This year also marked the first annual World Emoji Awards, hosted by Emojipedia.